The simple and effective tool for blocking access to a computers USB port! 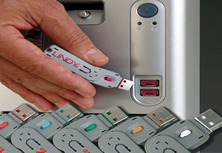 The USB Port Lock is made up of a combined â€˜keyâ€™ and â€˜lockâ€™ assembly which plugs into the USB port. To use, simply plug the â€˜keylockâ€™ into the port and release the latch - the lock remains in place! Plug the key back into the lock to remove. Easy!